I'm not sure just when I became enamoured of old recipes, but somewhere along the way I started collecting recipe books that pre-dated 1960. That's my arbitrary cut off date, why, I don't know. 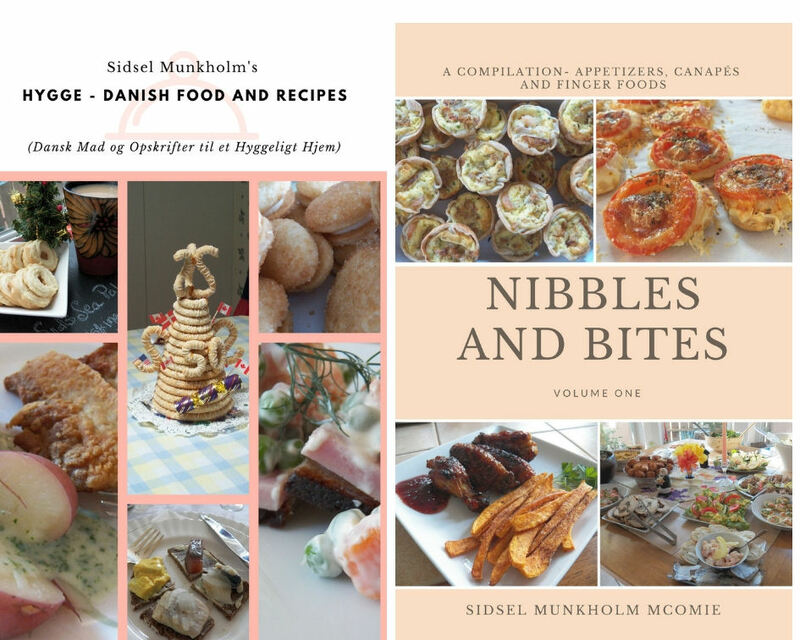 I do know that many of the modern cookbooks don't have the variety of recipes, methods or interesting list of ingredients that the older cookbooks have. So, I thought I would start sharing some of the older recipes that I think are really interesting. And some of these, I've even made. And when I do make them, I'll include the pictures, and any comments and procedures and failures here. The first one is actually a fruit cake recipe I found hand written on the inside frontispiece of cookbook I purchased at auction a couple of years ago. 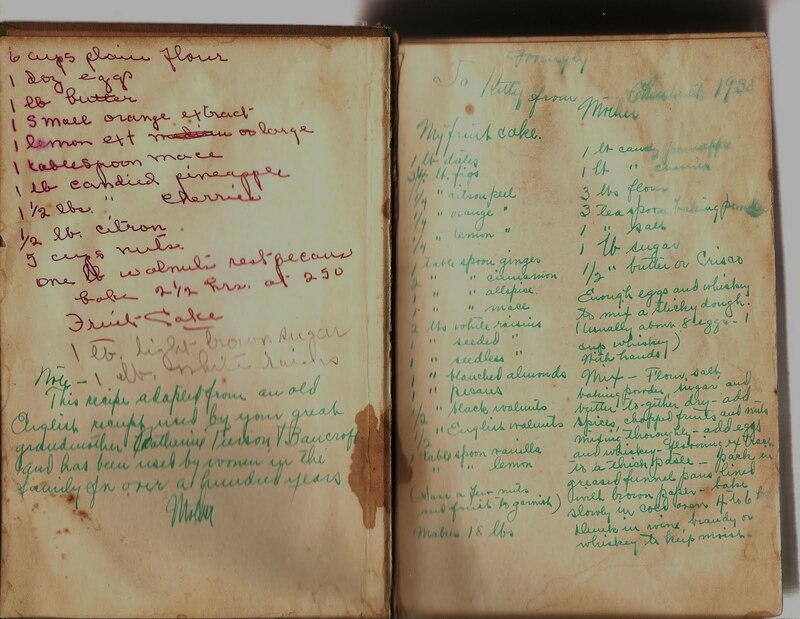 It's a Boston Cooking School Cookbook, published in 1937, and was a present to a young woman for Christmas in 1938. Bake 2 1/2 hours at 250 degrees. Then below that is this note from the author of the recipe on the right side of the frontispiece. 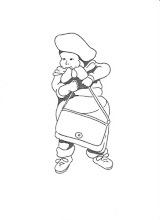 This recipe adapted from an old English recipe used by your Great Grandmother Catherine Pierson Bancroft and has been used by the women in the family for over a hundred years. Now for the recipe on the right side. (Save a few nuts and fruits to garnish). cold oven 4-6 hours. Dunk in wine, brandy or whiskey to keep moist. * I wanted to add a postscript to this. 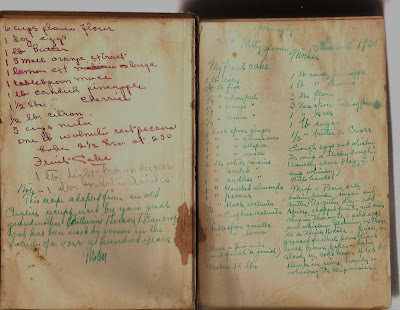 By sharing the recipe here, hopefully I've ensured that Catherine Pierson Bancroft's recipe will live on, even though her great-great granddaughter wasn't able to keep the cookbook with the recipe, maybe someone will make a note and keep it. I thought I would start with the Fruit cake recipe since it's almost time to make Fruitcake so it can be 'ripe' enough to serve at Christmas. One Lovely Blog and some useless? facts about me.